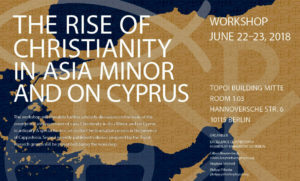 The workshop will stimulate further scholarly discussion on the topic of the emergence and expansion of early Christianity in Asia Minor and on Cyprus in antiquity. A special focus is set on the Christianisation process in the province of Cappadocia. Several recently published volumes prepared by the Topoi research groups will be presented during the workshop. 378: An Exact Date for the Rise of Christianity at Sagalassos?